[See update below] As the Wisconsin Republicans gear up to use their power of majority to force another corporate mining bill upon the state, the former Flambeau Mine in Ladysmith is turning out to be a tainted witness in an already bad jury trial. Often cited by extreme mining advocates as a “model mine,” on July 24, 2012 Judge Barbara Crabb found Flambeau Mining Company guilty of 11 counts of contaminating the water of the nearby Flambeau River and its tributaries. The court’s decision removes the Flambeau Mine’s status as an environmentally successful model. 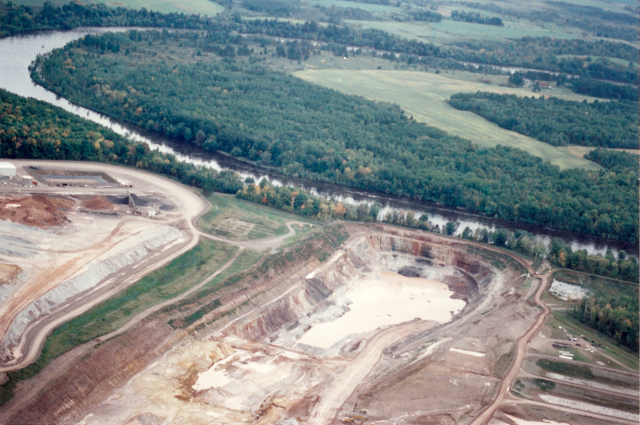 Current Wisconsin’s Mining Moratorium Law prohibits the mining of a sulfide ore body unless mine proponents can point to a mine that has been closed for at least 10 years without polluting the environment. According to one of the plaintiffs in the suit, Wisconsin Resource Protection Council, Flambeau Mining Company only began to address their pollution after the lawsuit was filed in January 2011. In examining the history of the Flambeau Mine, however, a different kind of model is revealed. This is a model for how extreme mining advocates create a campaign of propaganda and misinformation to mislead the public on the benefits of mining and downplay the environmental dangers. “Cartel” describes this consortium of power—public officials on all levels of government, media, and corporations that will profit from mining at all costs—with a formula to get their foot into the door of local communities, as well as changing the laws to suit the needs of the mining companies. Back in the days of Flambeau, which operated between 1993 and 1997, the mining cartel behaved exactly as we are seeing today. This article from the March 25, 1991 Eau Claire Leader Telegram misleads the public on the economic impacts of a mine in Rusk County. This article from the Ladysmith News, October 31, 1991 reveals the same players of today’s mining battle—Wisconsin Manufacturers & Commerce—making the same claims to an economic prosperity for the region that never materialized. 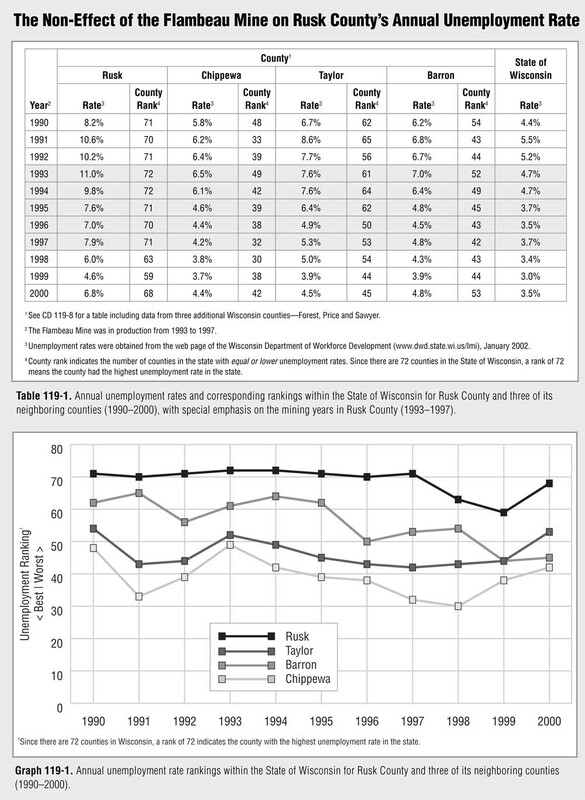 However, according to data received from Wisconsin Department of Workforce Development in 2002, Rusk County had the highest unemployment rate in the State during the years the mine operated (1993-1997). In fact, read the actual news reports through the years that revealed a rising unemployment rate while they were operating. 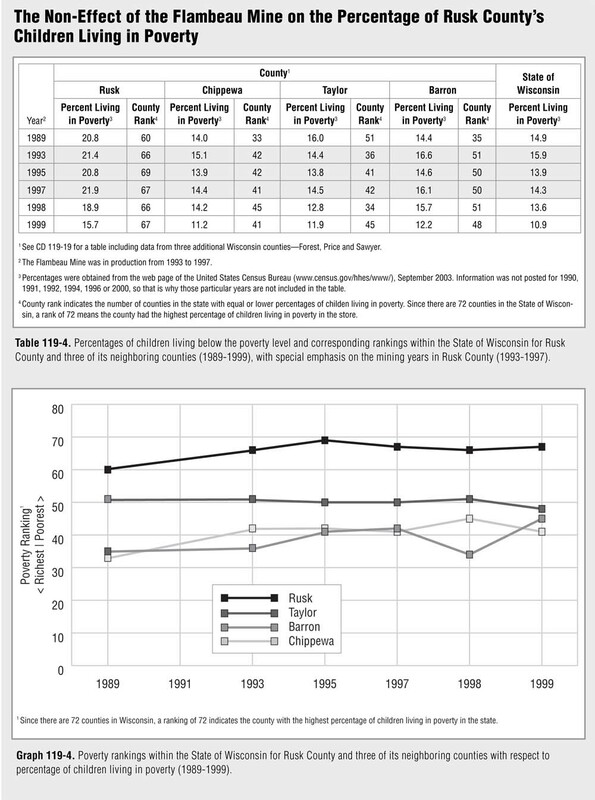 As far as Haney’s claim that he and his mining cartel could ensure the future of the children, figures show that children living in poverty actually went up slightly in Rusk County during the mining years, and that the county had the highest number of children living in poverty of all the counties affected by the mine. Equally significant when looking at the health of a local economy is the annual per capita income. 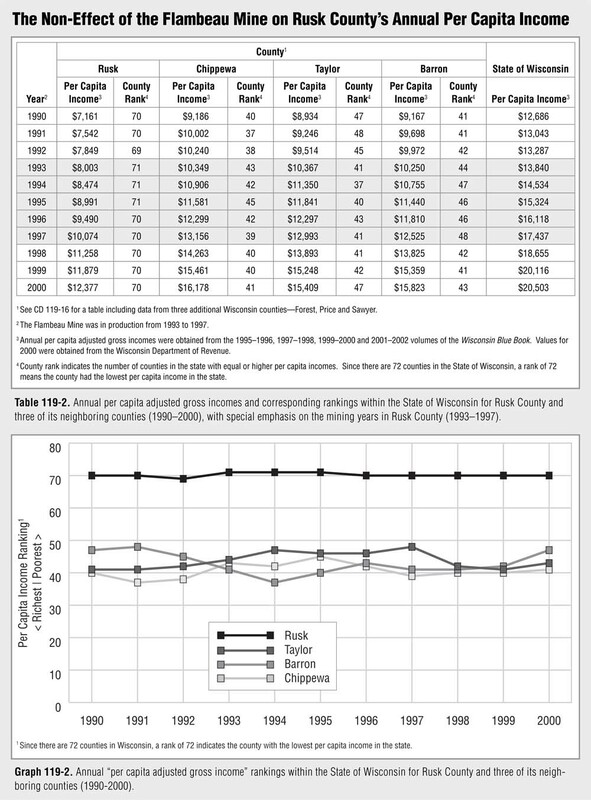 As much as the citizens of Rusk County were told over and over how much a mine would increase their economic prosperity, the county’s annual per capita income, relative to the other counties in the state, actually decreased during the years Flambeau operated. Also, during the years the mine was in operation, Rusk County had the highest level of poverty of all the surrounding counties. Extreme mining advocates are still misleading the public with claims that thousands of new, high-paying jobs would be created by a mine in the Penokee Hills. Equally misleading are their claims that a 22-mile open-pit iron ore mine in the middle of the Bad River watershed will have no negative impact on the environment. 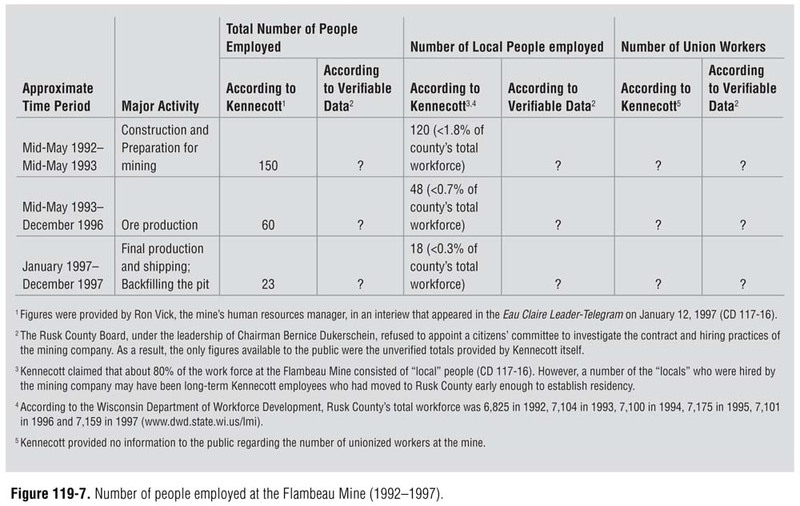 If Flambeau Mine is a model for anything, it proves that these claims are decided false. Both economically and environmentally, Rusk County was damaged by the mine. As Wisconsin considers changing the mining laws, let’s learn from our history. The truth should be valued over the same corporate rhetoric that has apparently plagued the State for years. Mines do not bring jobs or economic boosts. There are no examples of non-polluting mines, and once again Wisconsin is under attack from the corporate mining cartel that is flooding the media with misinformation and putting our resources at risk. Contact your legislator in Madison and demand that they make no changes to the current mining law. Then educate your friends and neighbors on the Wisconsin mining cartel and urge them to take action. 1 Source: The Buzzards Have Landed The Real Story of the Flambeau Mine, Roscoe Churchill and Laura Gauger, ©2007 by Roscoe Churchill and Laura Furtman, Deer Tail Press. Reprinted with permission. See more on Flambeau Mine here. DOWNLOAD FREE PDF OF CHAPTER 119 of The Buzzards Have Landed and read the full story: Did The Mine Help Rusk County’s Economy? It is excerpted from my blog “Namekagon Notebook”, which is at my website http://www.daveworld.biz/namekagon-notebook-by-james-bailey.html. Posts on the proposed Penokee Range iron mine occur on: 7/18/11, on 9/23/11, on 1/11/12, and on 3/13/12. There should not be any mining done in Wisconsin – politicians and lobbyist should not be allowed to endanger our natural resources. Our Department of Natural Resources and environmentalist should be making these decisions.